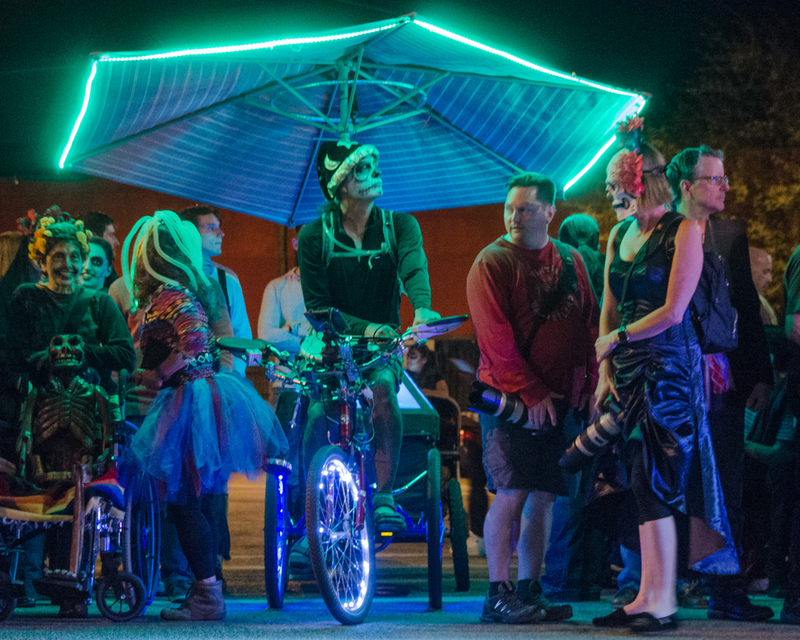 The All Souls Procession is put on by the arts community of Tucson and is the largest of event of its type in North America every November. 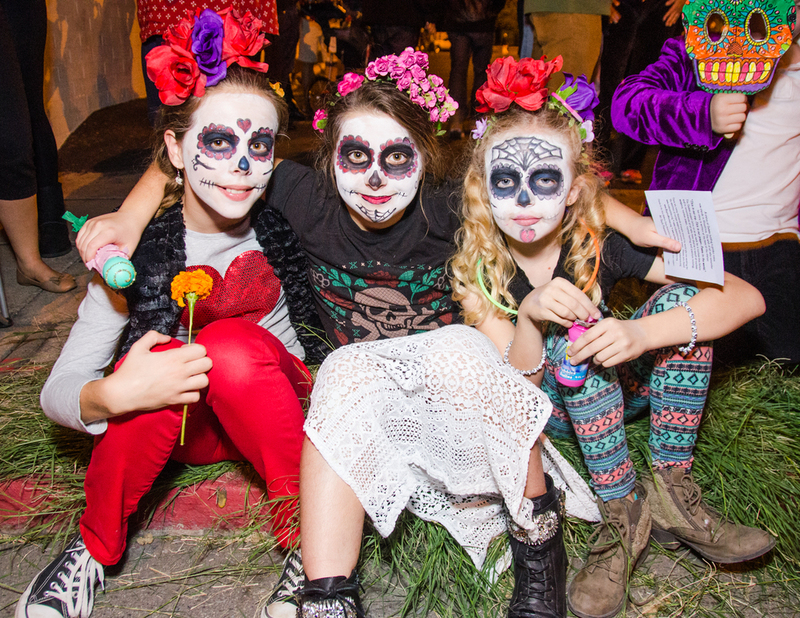 It is also part of a great Mexican tradition called “Day of the Dead” and reflects the strong traditions from Mexico that have sprouted very strong seeds in the US. About 150,000 people came together to commemorate and honor the unity with those who have gone before us and extend a warm and open communion with anyone who wants to participate. It is an opportunity to step outside the norms of everyday and be part of a masquerade where people show what they more truly feel inside. This is a combination of mourning and celebration and in a sense is a "serious good time." Participants prepare for months, in some cases. In other cases, they do their costume and make-up that day - all to be part of something bigger than themselves. I went to Tucson to photograph the event and the people who participate in it. As you can see it was a remarkable experience. One of the pleasures was that people were delighted to have their photographs taken as part of their night. These images are treasures brought back from that expedition. 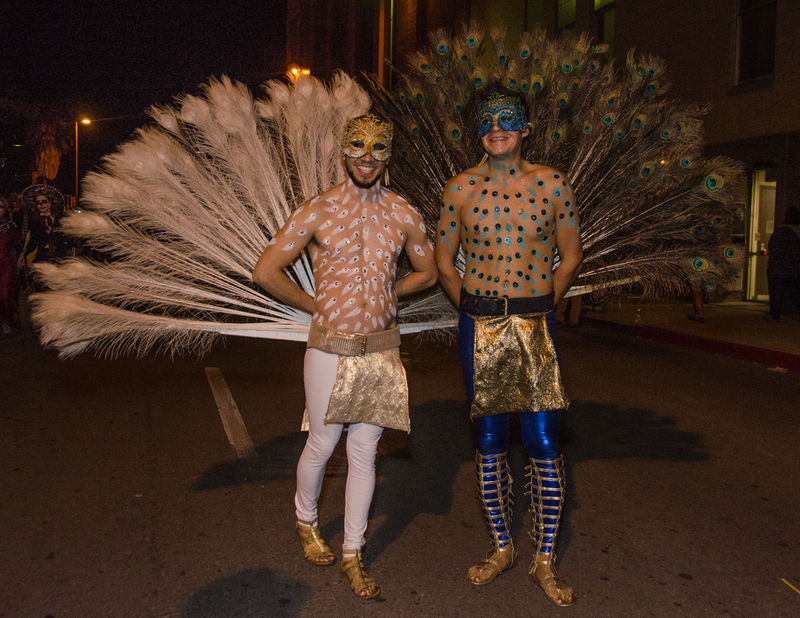 Think about coming to Tucson for the 2016 edition – But be prepared for an even bigger crowd. You will love it! In March I had the opportunity to participate in a three day photography workshop at the Phoenix International Raceway NASCAR races. The two races held during the weekend are part of a year-long series of NASCAR events at tracks around the US. I was hosted by Hassan Kareem, CEO of Brotha Love Productions, who has the goal of getting a more diverse array of photographers participating in NASCAR motorsport photography. As part of the weekend, I was issued a press credential which allowed access to just about every area of the track and grandstand overlooks – and the opportunity to make photographs of how the whole race works. In a conversation about the weekend with a friend afterwards, it occurred to me that there are many life lessons to be found in NASCAR racing. In particular are the ones related to the readiness and capabilities you need for success in photography as well as life in general. To start with, you do not wake up one morning, show up at a NASCAR track and hop in a race car. However good your intentions, or the amount of $ in your wallet - those things just do not matter. What does matter for a NASCAR race is your readiness and that all of your racing capabilities elements are thoroughly developed. Even if you are the best driver, the quality and preparation for your cars, crews, and owners as just as, and perhaps even more, important. The track also has to be finely tuned and constructed – with world class facilities, customer services, food services, and above all provisions for safety both on the track and off. Consider the drivers. Some are as young as 18. I asked how someone that age could take on driving as powerful (700-900 horsepower) and expensive a racing machine? Who would trust that person and allow him or her behind the wheel? I found that the learnings and experience that enable a person to make it as a driver begin about the age of 5 at go kart racetracks around the country. Competitions take place for every age range and continue through into the teens. The races get longer and more challenging, the cars more powerful and expensive. This is a serious sport and less and less of a casual, weekend fun hobby. Every time the young person gets behind the wheel he/she builds up a greater understanding of vehicles, tracks, strategies for winning, how to manage risks, etc. After ten plus years of this – that young person proves to him/herself and others that this rookie can take on this level of competition and win. The same process and practice is true for car designers, crew members, racing team managers, and those who lead the racing organization. It takes a lot of people, talent, the right kinds of experience and the right levels of financial support to get that car out on the track and across the finish line. Just take a look at a driver’s racing outfit or the number of sponsor logos on one of the cars. This is not a sport for the faint of heart or pocketbook. Costs are the neighborhood of $5-$7 million annually to have a competitive top-20 team ready to take to the track. Be prepared on all counts! Perhaps the best example of all this coming together is what goes into making of a pit stop. The crews are in constant touch with the drivers. They know exactly how much gas is left in the tank, how much mileage can be squeezed out of a set of tires, how the right or left alignment matches up with how the track conditions are that day, and when, strategically the car absolutely needs to come in for the necessary pit stops – a 14.5 seconds on average window for refueling, changing the tires, and making any of the other adjustments that will keep the driver and car in the best competitive advantage. One more factor needs to be recognized as being at play here – The Human Factor. The lead for the major race of this weekend came down to two competing drivers, Kevin Harvick and Carl Edwards. Harvick was barely in the lead, with Edwards literally right behind him. Edwards knew that if he bumped Harvick’s car just enough, Harvick and his car would lose just enough traction for Edward to run past him and come across the finish line as the winner. Edward did bump Harvick, but stopped short of the second bump he need to carry the day. The result was that Harvick won by a 1/10 of a second. No race gets any closer than that. Let’s focus on the human dilemma we have here: The driver must sort out what actions to take that will make the difference, what the risks will be, and if he or she has it in them to cross the line to make that happen. Carl Edwards chose not to cross that line, probably because he did not think it was the right thing to do as a professional race car driver. The outcome - Kevin Harvick came down Victory Lane and Carl Edwards did not. The point is that the driver and the team have to reevaluate conditions and choices and determine what any action is worth on a second-by-second basis. This goes beyond driving experience and how good your car is. It comes down to the person, what that person is about, how he or she appraises options and what he/she is willing and able to do with those options. Then there is the additional fact that these cars get banged up and a full back up component of cars, drivers and crews has to be ready to jump into the race at a moment’s notice. In the end, everything, large and small, must be optimally considered and capitalized on to get that winning outcome. Does this ring any bells with photography and life in general? It does to me. How prepared are you for a photo shoot? Have you built up the skills for posing, composition, lighting, creating rapport with models and clients, etc.? Have you thought through the shoot: finding the right location and props, getting the timing and scheduling right, bringing the right gear so that you have various options available and packing so that everything is accessible as needed? Have you sketched out the shoot to see how to set up for the shots? The better your forethought, the more chances to take advantage of unexpected opportunities and changing conditions. Are you engaged in continuous learning or tending to stay in your comfort zone? What kinds of risks might you take to get out of your comfort zone? What do you need to learn to be able to do that? Do you have the capability to go the full 300 plus laps and make those split second decisions that will take you down Victory Lane? NASCAR races are both a business and a sport, but a sport at the highest level of complexity – and as it turns out, simplicity, too - with immediate consequences for every decision and action throughout a whole race. There are no time-outs. The competition is relentless. The bottom line is whether you are prepared for this level of endeavor, or willing to become ready, to build your essential core capabilities. Don’t be deterred if you are not there yet. The truth of the matter is that no photographer, person or organization has all of these fully operating, just as no NASCAR racing team has all of its capabilities at full peak. Just as importantly, every one of us has at least some to start with. Of course, the more you build these capabilities, the greater the chances you will end up getting those iconic photos for you and your clients on a regular basis. · Be willing and able to go the distance and do what is necessary to win - despite engine blowouts, being banged on, coming way too close to the wall or even crashing, and still be the first car to cross the finish line.